The Seersucker man is very proud of his 7 year old daughter. She has only just begun to play the piano, and yet he has already filled his iPhone with nearly 100 videos of her scratching out Twinkle Twinkle Little Star – with varying degrees of accuracy. A Virginia-born company lawyer with a penchant for American history, fine English shoes and Cuban cigars, he is the archetype of a polite, handsomely educated family man with a pleasant, personable mildness that mixes sublimely with the smoke from his Partagas No.4. His wife is an immaculately attired, red-lipsticked, Pinterest-posting baker, who has kitted her cinnamon scented home outside of Richmond in a patriotically loyal New England style, all gingham informality and lace-edge pillow cases. They often attend summer Fourth of July parties with some of their smarter, bow-tied neighbours, with her attired in a floral Lily Pulitzer, and her husband in a pair of cream drill trousers, chestnut semi-brogue shoes and his Brooks Brothers Seersucker jacket. The Pink Linen man is one of those unicorns of adulthood; a natural blonde. Shamelessly stylish, he is drawn to extravagant Italian tailoring, which he wears with Teutonic precision and Swedish aesthetic purity. 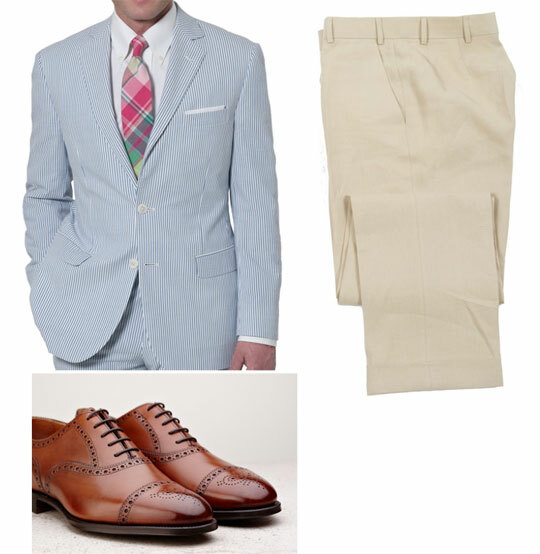 He wears few suits in summer, favouring the Pitti predilection for odd jackets and trousers. His trousers – break-less of course – are exquisitely shaped around the contours of his legs and his jackets, painstakingly sculpted around the waist, he owns in a variety of wool flannels and silk-linens. 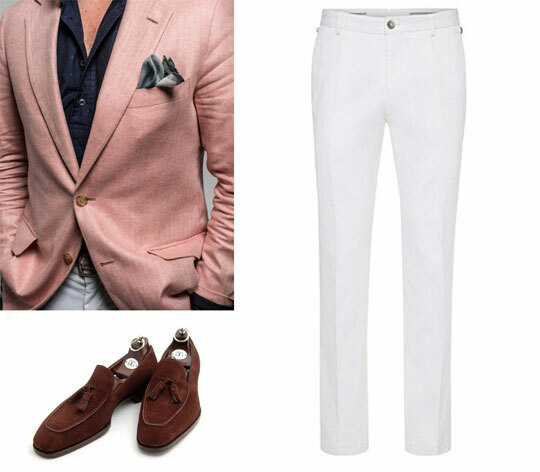 One of his summer specials is a rose pink linen Rubinacci jacket, which he wears with slim white trousers and sockless tassel loafers in the light Swedish summers on his family’s island clapboard home in the archipelago or at sunset down on one of the bar barges next to Strandvägen, utterly unaffected by the beauty surrounding him. The Brass-Buttoned Blazer man is a remnant of the era of the Rotary Club, chequebooks and indoor smoking. A moderately successful insurance salesman in the City, he cuts a figure reminiscent of Lawrence Jamieson from Dirty Rotten Scoundrels – all smarm, Brylcreem and sovereign rings. Married three times – twice to the same woman – and now widowed, he now lives a genteel existence between a Surrey cottage and a dank bedroom at his London club, where he attempts to lure leathery ex-showgirls, unwanted by their husbands. 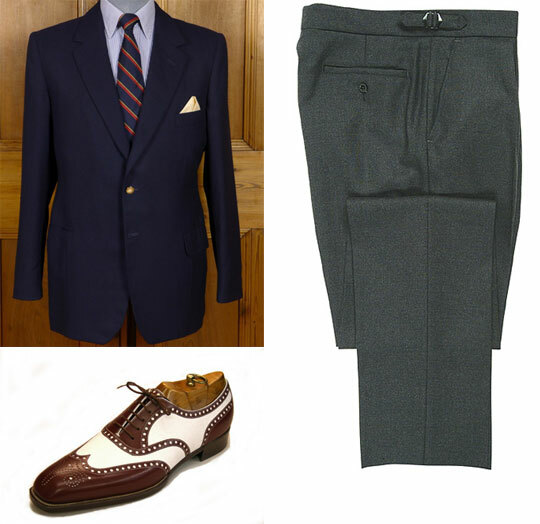 With grey flannel trousers, a club stripe tie and rakish brown and white spectator shoes he wears a hopsack blue blazer with his club’s crest buttons – now rough around the edges and stained on the sleeve: a treasured relic made by Dege & Skinner during his glory days. The Cream DB man has long, cavalier hair and thick, stumpy fingers that look like chorizo. The mixed odour of tobacco and eau de cologne is ever present and his gravelly, broken voice betrays years of high living. He runs his somewhat indelicate fingers over an elegant, 16th century sculpture that one of his clients, a squinting telecoms tycoon, is considering buying. His art and antiques gallery, just around the corner from the Piazza della Signoria in Florence, is more of a social lounge than a store. Though he lives regally in a bright apartment overlooking the Arno, he has had to re-mortgage his Tuscan farmhouse near Volterra; slow trade is hammering his preferred lifestyle. He welcomes old friends into his store in the manner of a skilled maitre’d welcoming VIPs; lightly flirting with the women and backslapping the men. 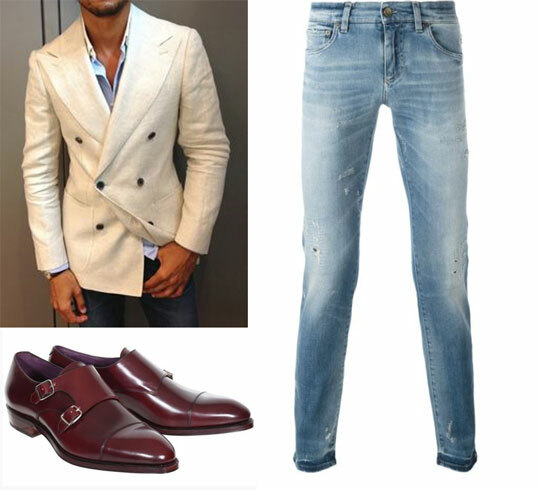 He takes them through his new pieces, each one is ‘meraviglioso’, each one is ‘importante.’ At 12pm, he closes the store for a long lunch, whilst regaling his group with a story of a Greek reliquary he secured in Istanbul, wearing a cream double-breasted blazer from Al Bazar, slim D&G denim and Burgundy monkstraps. what colour socks is Brass-Buttoned man wearing?